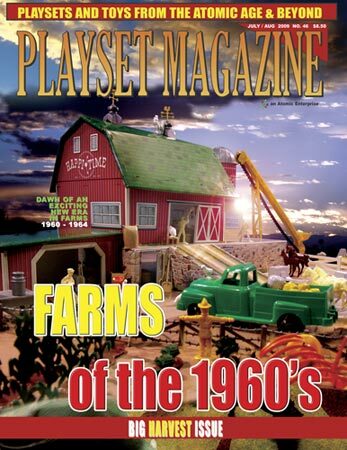 Issue 46: Farm Sets of the Sixties! The Farms of the Sixties! 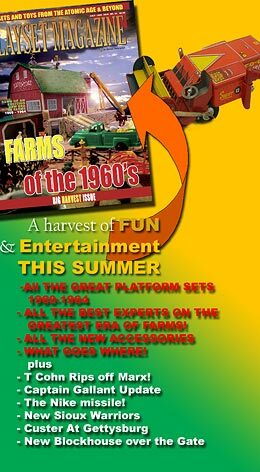 You'll watch in awe as the giant platform farm developes into behemoth sets – See exactly how Marx imitates Life and get the lowdown on all the great sets, large and small; the figures, animals, accessory groups and learn exactly what goes where with those partial sets in the basement! New Silos! . . . New Conveyors! . . . Friction Trucks & Harvester! . . . Crop Duster Airplane Sets! The greatest experts on Marx Farm Sets all gathered for one giant, over-sized issue! T. Cohn rips off Marx farms – Will there be a Trial? Ohio Art Clones Marx and you need to know! Is it worth it to buy old movies on this expensive new media ? - Our Blu-Ray media report concludes! New Hobby Bunker Recasts – essential news! Our own editorials, classified and display ads, more! 15 pages on the Marx farm Sets – more in depth reporting than ever before! 7 Mint In Box contents lists! We also have news on the video and DVD front! Volume 8 The Space Sets is being released with this issue! Thank you all for stopping in and we'll see you down on the farms this issue!